Much has been written about conferring with younger students, but in the current professional literature, I find little that addresses the needs I have in my secondary classroom. I know when I talk to my students in one on one conferences, they grow more as individuals who engage in reading and writing more critically. I believe that if teachers will talk to their students more, teaching them as individuals instead of the collective, students will respond in ways that delight and surprise us (and often surprise themselves as well). The topic of conferring consumes my reading life of late, and I find myself reading Misreading Masculinity with this guiding question: How does this relate to my study and work on talking to students about their thinking? As a credo for education in a multicultural society, I don’t think we can do better than that (Newkirk, 13). Educators must relate to students as individuals with a variety of interests, passions, backgrounds, and literary histories. We must try to think like they do if we are ever going to develop relationships that engage the teenager in reading and writing experiences that invite them to take on the qualities of readers and writers. Our goal should reach far beyond the idea of school. It must reach into a student’s future life. 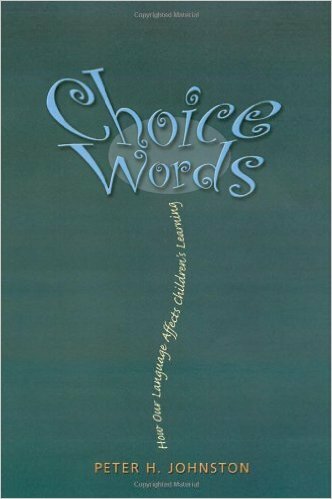 In the book Choice Words, Peter Johnston discusses the importance of tapping into students’ literary histories in order to give them a literary future. What experiences has the child had with reading and writing that have formed her belief about herself as a reader and a writer? We must learn of these experiences and then validate them if we ever expect to move our students from the starting places at which they come to us. Regularly conferring with students is a vital part of getting into the “consciousness of the child.” However, many high school English teachers instruct their students as if they all experience the same culture and the same consciousness. No wonder groupthink is so prevalent in our communities and in our politics. It is a reflection of how students receive instruction. This whole class, one-size-fits-all, standardized teaching (not to mention the tests) is detrimental, not just to boys, but to all students who deserve to be instructed at an individual and personal level. This brings me back to an integral moment shared with one of my male students this year. His choices for IR were continually that which explored the incarceration system; from memoirs to informational pieces to much in between. So, when he answered my question, “Tell me! What is your fascination with learning about incarceration?” with, “Ms. Bogdany, no one teaches you about this. I have to do my own research.”, I knew that simple question opened up door upon door to further dialogue, book recommendations, and beautiful authentic writing (about his own experiences outside of the classroom leading to his curiosity). Male students need to feel safe and connected. And when they do, their voices become clear and articulate. They become sharers. Their insight grows. I love your use of the word “groupthink.” It’s the perfect word to describe the opposite of the individualization that happens in the workshop. Not only is it detrimental to our students, it’s detrimental to our teaching force too–textbooks and other standardized curricula imply that teachers must all teach the same things the same way. When we value the consciousnesses of the teacher and student, instruction can be doubly enhanced.